The Arkansas & Missouri Railroad (A&M) was established in 1986 as a Class III Railroad operating a 150 mile route from Monett, Missouri to Fort Smith, Arkansas. A&M's corporate headquarters is located in Springdale, Arkansas; major operations are based there and Fort Smith. The company provides freight service to customers along its route and excursion passenger service between Springdale and Van Buren/Fort Smith. A&M interchanges traffic with three Class I railroads: Burlington Northern Santa Fe (BNSF), Kansas City Southern (KCS), and the Union Pacific Railroad (UP), as well as the Fort Smith Railroad (FSR). The A&M is rated at 286,000 lbs., cleared for double-stack rail cars, and main line features continuous welded rail. 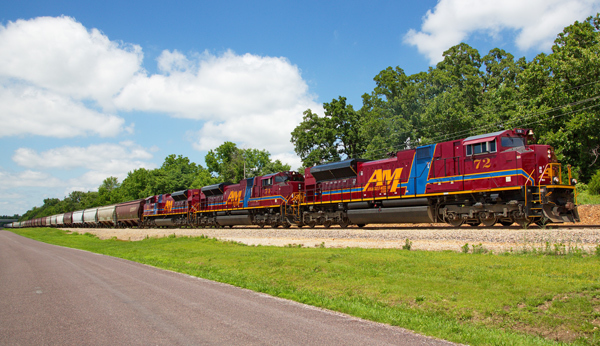 The A&M extends its customer reach through collaboration with other Class I and short line railroads across the United States, Canada and Mexico. The A&M enables seamless water-based intermodal options through A & M-served river ports in Van Buren and Fort Smith, Arkansas. Port operators there provide a variety of storage, inspection, transload, packaging, and other logistics services. The A&M's sister company Ozark Transmodal, Inc., (OTI) provides transloading and trucking operations in Gateway, Springdale, and Fort Smith, Arkansas, as well as Butterfield, Missouri. OTI provides a wide range of transloading services for various types of commodities, inbound and outbound, for customers who do not have direct access to rail or need storage of inventory. OTI and A&M provide seven acres of outside inventory space and 100,000 sq. ft. of warehouse space in Fort Smith, and 36,000 sq. ft. of warehouse space in Springdale, with additional outside storage available at Springdale and Gateway. The Fort Smith warehouse features a plastics logistics operation which includes packaging and blending capabilities, the only such facility in the region. In addition, A&M serves a broad array of high-quality transload, warehouse and logistics partners specializing in a variety of commodities and services, including temperature-controlled storage and transportation, dry and liquid bulk trucking, specialty metals handling, and food grade, bonded warehousing. Combined with flexible rail transportation, these logistics partners allow us to handle virtually any product in an efficient manner customized to fit product requirements. Contact Marketing at 479-725-4005 or 479-790-5154 to learn more about the full line of freight services available, or email us.